1Endorsed by: The Society of Obstetricians and Gynaecologists of Canada; Motherisk; The College of Family Physicians of Canada; Canadian Association of Midwives; Association of Obstetricians and Gynecologists of Quebec; Federation of Medical Women of Canada; Society of Rural Physicians of Canada; Canadian Association of Perinatal and Women’s Health Nurses. • Universal screening for alcohol consumption should be done periodically for all pregnant women and women of child-bearing age. • Healthcare providers should create a safe environment for women to report alcohol consumption. • The public should be informed that alcohol screening and support for women at risk is part of routine women’s healthcare. • Healthcare providers should be aware of the risk factors associated with alcohol use in women of reproductive age. • Brief interventions are effective and should be provided by healthcare providers for women with at-risk drinking. 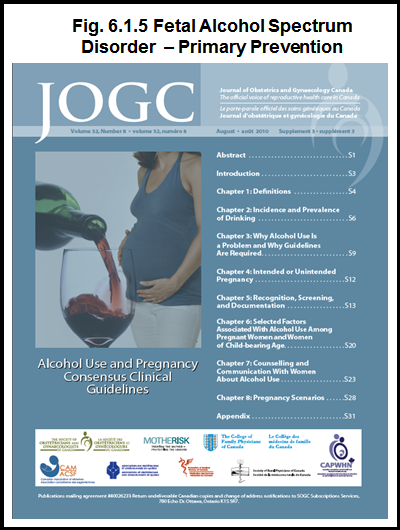 • If a woman continues to use alcohol during pregnancy, harm reduction/treatment strategies should be encouraged. • Pregnant women should be given priority access to withdrawal management and treatment. • Healthcare providers should advise women that low-level consumption of alcohol in early pregnancy is not an indication for termination of pregnancy.